We all know honey is a great natural sweetener. This liquid candy comes in many varieties ranging from very light clover honey to very dark buckwheat honey. Some are delicately flavored while some are very strong. Different areas of the globe can produce very different kinds of honey. But did you know that honey is useful outside of the body as well? There are so many uses for honey that it boggles the mind. Honey is a humectant. It pulls moisture from the air and binds to it. It makes a great addition to hand and face creams for this reason. I add it in when I make my milk and honey soap. Just a bit is fine…you don’t want to add too much. It adds extra moisture which may prevent your soap from setting up. After I use an exfoliant on my face, I spread honey on it and leave it for about 15 minutes before rinsing it off. It leaves my skin so soft! Try this skin-softening trick on your hands too. Honey is also antibacterial. When used in wound care, it seals out bacteria and helps to speed healing. Dab a bit on a bandage and you’re set to treat burns, scrapes, and cuts! Honey has enzymes that produce a substance like hydrogen peroxide, which will help to disinfect wounds. It can also help to reduce swelling. One of the most simple blemish treatments comes from the use of honey. Take a bit of salt mixed with a few drops of water and spread it on a bandage. Place this over the blemish for a few hours. The salt will soften the top of the blemish causing it to break open. (If it doesn’t open up after a few hours, redo the bandage and leave it on a bit longer.) Then wash it off and gently pat dry. Next, apply a bit of honey to a dry bandage and place it on the blemish. The honey will form a seal over the blemish which will heal rapidly after that. I usually do this part overnight and rinse it off in the morning. Internally, honey has been used to treat allergies. The old saying “eat local honey” is very true. When you eat honey that is produced in the region that you live, you ingest small amounts of pollen. It’s kind of like the desensitization technique used by doctors for people with severe allergies. Eating a specific variety of honey will help even more. For instance, I am allergic to sourwood trees, but if I eat sourwood honey for several weeks before they bloom, I don’t sneeze nearly as much. Just about any type of honey will work for hay fever, which is a short description for just about any kind of pollen-induced allergy. You can also use it as a vehicle to deliver medications. Adding crushed medications to honey makes them more palatable. This method works great for kids (over one year old) and the elderly. Just be sure there are no contraindications with honey and the medication you’re using. It’s rare for honey to react with some medications that you’re taking, but it can happen. Some people are allergic to bees, but can still consume honey. Be sure to check with your health care provider before using honey if this is the case. Honey is a real food ingredient. Try substituting honey for refined sugar or other sweeteners in most of your favorite recipes for a more healthful dish. You can also steep herbs in honey for flavor or medicinal purposes. Lavender honey is great in iced tea. Lemon balm honey is a great bedtime treat, and as a bonus it will help you sleep! Checking your local tailgate market or farmer’s market is the best way to find the freshest local honey available. You can also check LocalHarvest.com to find local bee keepers. Look for raw (unheated), unfiltered honey, which still contains all the beneficial properties. Forget about buying the little plastic honey bear at the grocery store, which is likely to be cut with other sweeteners, and has been pasteurized until all the nutritional elements are destroyed. Try some honey today, but not just in your tea…add it to your daily skin care and first aid routine too. 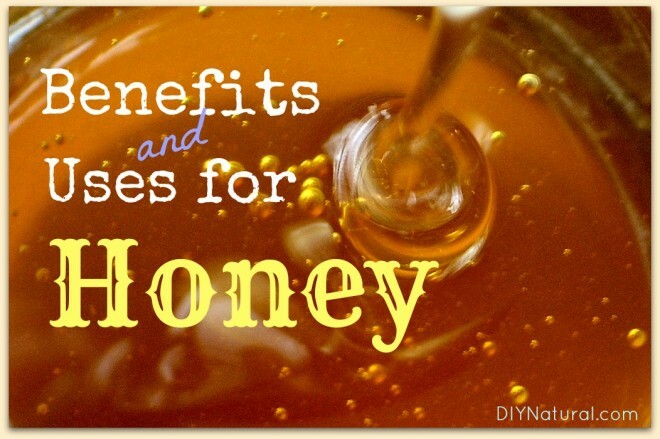 Have other favorite uses for honey? Share them below. Nice article…thank you! I love local, raw honey! I get mine from a variety of sources, but love getting it in bulk from the coop in my own wide-mouth glass jars. (They tare my bottles when I come in and are so nice!) I solar-infuse herbs in honey: sage for sore throats, nettles for general nutrition, roses for face wash, and more. When I strain the herbs out of the honey, I bottle the honey in glass and label it. Then, I make tea with the honey-coated herbs. YUM!!!! My favorite facial cleanser is rose-infused honey. I solar-infuse my own roses in the local raw honey in a clear glass jar in a sunny window. At the same time, I dry more rose petals on a screen in a shady area with good airflow. Then, I grind the dried rose petals and add them to the strained rose-infused honey once it is finished. Adds a super fragrance and gentle exfoliant to the honey. I simply spread about a 1/2 teaspoon of the rose-infused honey on my face and gently rub it in my skin; let it sit 30 seconds to 20 minutes (depending on how much time I have); then splash it off with tepid water (only takes 2-3 splashes). All the skin oils and dirt wash away with the honey and my skin is left feeling fabulously clean and moisturized! After reading this I purchased some local honey. I’ve been using a tiny bit of the honey mixed into a natural, local beeswax cream on my dog’s ear. He has had a long term issues with gunky ears and this has nearly cleared him up completely after 3 days. Yeah for natural! And he doesn’t run from me when I get the stuff out like he did when I was using something from the vet. Honey, crushed garlic, ginger, cinnamon, thyme and lemon. Stops the flu, takes care of the cough! (You can use any amount of ingredients you like- the stronger , the better! You can also use honey mixed with Olive oil on your hair to give it back the life, shine and bounce. I use equal parts of honey (raw & unfiltered), liquid castile soap (eucalyptus scent which i love,) vegetable glycerine, & a couple of drops of tea tree oil for facial cleanser. I’ll probably never use anything else. Removes all my makeup. I love it! I’m looking forward to using the other applications mentioned in this post. Thanks! Thanks Leah! I’ll have to try your recipe too. I use to have problem with blemishes, aven at my age (I’m almost 50! ), and it seens that the honey has really helped. I don’t have any wrinkles either!